As temperatures warm, people are outside enjoying the almost, spring-like weather. There are still a few waiting for even warmer temperatures to arrive and stick around for more than a day - you know who you are. As everyone migrates outdoors as temperatures rise, the chances of an insect encounter will be pretty high. At the first encounter, many people may have an urge to "eliminate" the six legged species. Some may have thoughts of a quick step and smush, others may want to reach for a bottle to abolish the "pest." It is important to take a step back - not necessarily to avoid the insect, but to identify it first and then act accordingly. Many times the recommended action will be to do nothing at all. Many insects that we encounter are beneficial and have important jobs to accomplish in what is typically a rather short life-span. Jobs that would be hindered if we stop their existence simply because we don't like insects, we have a fear of insects, or just don't care. Earlier this week, a homeowner had an insect encounter as they were walking around the outside of their home. Instead of going into kill-mode, this homeowner collected the insect and brought it to their local Extension office for identification. 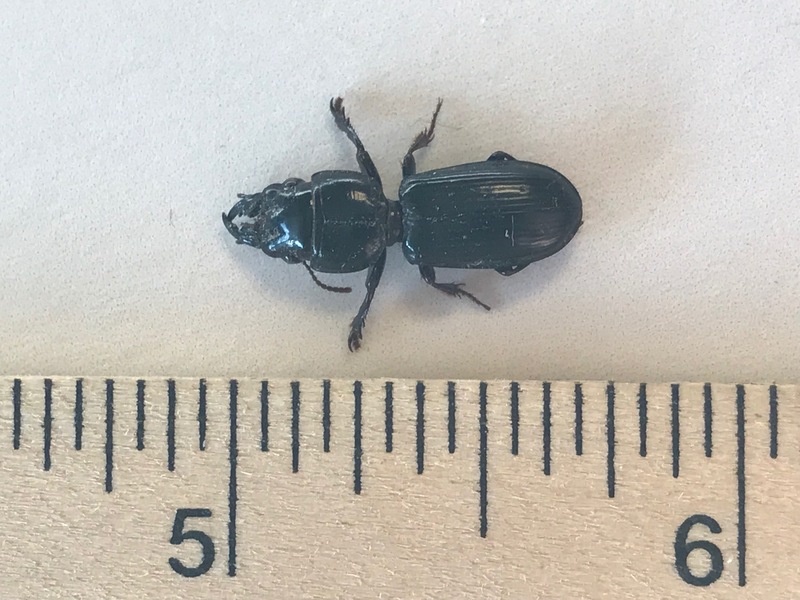 Photos were taken of this rather larger black insect and the images began making the rounds being shared among Extension professionals. The insect was identified as the big-headed ground beetle, aka the pedunculate ground beetle (Scarites subterraneus). This insect is a predator and great for the garden. If you weren't familiar with the big-headed ground beetle, you are now. These ground beetles are very common in cultivated soils. They are about 1/2 to 3/4 of an inch in length, have a flattened appearance, and have front legs designed for digging. If you come across an insect that you aren't familiar with, don't assume the worst, although there are some bad insects in the bunch. With care, collect the insect or take photos of the insect and do some research. Photos should be clear and also illustrate a size comparison whenever possible. Bad photos can lead to a bad identification or no identification at all. Blurry images can often make it impossible to identification an insect with 100% certainty. Engage your local Extension office, reach out to members of our BYGL writing team, connect with a green industry professional such as a certified arborist, landscaper or garden center expert, or take a look in books or on the internet. And finally, we mention the internet. Just a reminder that not everything you read on the internet is true. While seeking information, you will also have to search out the truth and sort through lots of other information. Sites that end in "edu" are a great place to start. Enjoy the warmer temperatures and expect an insect encounter while you are gardening, landscaping or just enjoying nature this spring.